2014 Gleaner S78 for sale in Athens, AL. Haney Equipment Company Inc. Some people think the transverse rotor combine reached its functional limit several years ago. Others think competitive rotor configurations are infinitely scalable without reaching a point where weight, size and complexity might outweigh some of the design benefits. Both of these ideas are false. Cleaner Grain: ; Reduce grain loss ; Gleaners are renowned for their ability to clean grain and reduce loss on slopes because of the patented accelerator rolls and two-stage cleaning process. ; The cleaning process begins with distribution augers just underneath the threshing and separating system distributing the material flow into a smooth and even cascade into the accelerator rolls. ; Two larger-diameter five-fluted rubber accelerator rolls accelerate grain and chaff downward at four times the speed of free fall. The grain is then propelled through an evenly distributed air curtain from a larger 13-inch (330 mm) diameter, cab-controlled transverse fan. Dual-stage outlets provide air for pre-cleaning at the upper duct and final cleaning at the lower duct. The two-stage, high-velocity cleaning provides a high-quality clean tank sample, even at the highest harvesting rates. The separated grain lands on a cushion of grain on the louvered grain pan just ahead of the chaffer. ; The cascade pan has a 6-degree angle to move crop quickly to the pneumatic shoe for greater capacity in higher-moisture crops and on downhill operation. ; As lighter chaff blows out the rear, material from the pre-cleaning is processed by the chaffer and sieve. Engine: ; Power without compromise ; Pushing all Gleaner Class VI and VII S Series combines, you’ll find a dependable power and easy-to-service AGCO POWER 84 CWA-4V liquid-cooled turbocharged and air-to-air intercooled diesel engine. These engines feature e³™ SCR clean air technology that is more fuel efficient at higher horsepower ratings than previous models with deep power reserves. From 314 hp (234 kW) in the S67 up to 370 hp (276 kW) to drive the S77; with power bulge on the S67 at 1,950 rpm, that jumps to 344 hp (256 kW) and a power bulge on the S77 at 1,950 rpm that jumps to 398 hp (297 kW), respectively. The rear-mounted engine distributes weight better for less noise and vibration, and is more accessible for service and maintenance. ; AGCO POWER 84 CWA-4V Engine Features: ; Four-valve-per-cylinder cross-flow head permits our engineers to center the injector over the piston, improving fuel/air mixing to better control emissions and fuel consumption. ; Bosch common-rail fuel injection system takes its commands from the EEM3 electronic engine management software for precise, faster response and more power per gallon of diesel. ; Dual centrally supported cylinder liners eliminate liner cavitation, prolonging cylinder life. ; Lightweight, big-end connecting rods’ fracture-split production process leaves a rough edge at the face to improve holding power and durability while minimizing vibration. SISU POWER 84 CWA-4V features e³™ SCR (Selective Catalytic Reduction) clean air technology optimized for high performance, low particulate emissions and lower fuel consumption (meets Tier IV interim standards). 24-gallon Polyethylene tank holds Diesel Exhaust fluid (DEF) and is filled after every three fuel fill-ups. Environment: ; Be comfortable while harvesting ; The Gleaner ComforTech II™ cab and controls put comfort and convenience to work to improve the efficiency of every task and every operator. In the center of the cab is an adjustable air-ride high-back comfort seat with armrests that positions you within an easy-to-use and efficiently laid out control and monitoring system. An effective, automatic, climate-control system, rounded visor roof and tinted glass keep out the elements while still giving you full view. More than 120 cubic feet (3.4 cubic meters) of cab space is accessible by a 40.5-inch (1,028 mm) door. A large service door opposite the entry makes access to the console quick and convenient, while a large rear cab window gives you a complete view into the grain tank. Further improvements have been made to reduce noise levels versus previous models. Grain-Handling System ; More efficient unloading, better grain quality ; The unique DirectFlow™ swivel unloader on all Gleaner S7 Series accomplishes the marvel of an average unloading speed of 4 bushels per second throughout the entire unloading process with a larger 12-inch (305 mm) grain bin cross auger that feeds a massive 14-inch (356 mm) unloader auger. This DirectFlow two-auger design is the basis for our S7 Series unloading system. ; Because we only use two augers rather than three, like our competition, Gleaner provides more efficient unloading with better grain quality and less wear. No gearboxes. No open drives. No vertical augers. ; With the transition angle between the grain bin cross auger and swivel auger reduced, it means less horsepower and reduced fuel consumption to achieve this impressive unloading rate. ; The unloading auger provides a 15-foot (4.54 m) discharge height and a 23-foot (6.98 m) reach from center. ; On the S67, with its massive 330-bushel (11,629 L) grain tank, the unloading time is 75 seconds. The S77 unloads its optional 390-bushel tank (13,743 L), with the largest Class VII standard bin capacity, in 83 seconds. The optional 390-bushel grain tank with foldable bin extension unloads in 98 seconds. Natural Flow System: ; Tritura processor and natural flow system: ; One of the main things that makes a Gleaner Super Series unique is the Natural Flow™ feeding and threshing. With the rotor setting the width of the combine, the crop does not compress or change directions when moving from the feeder house to the rotor. ; The process begins as grain enters the machine through the 69-inch (1,752 mm) long by 39.5-inch (1,003 mm) wide feeder house that is powered by an 8 5/8-inch (219 mm) diameter front feed drum. The feeder house can be reversed with the touch of a button from the operator’s seat in the event of a plug. ; The feeder house pivots vertically at the first chain, anchoring the rear chain on a fixed angle regardless of header height. The second chain outpaces the first by 6 percent to prevent bunching. Four-strand undershot feed chains offer 33 percent more chain support than competitive three-strand feed chains to help prevent bent feeder slats. ; In addition to keeping the crop moving in a smooth ribbon from feeding to threshing, the Natural Flow system has an additional feature that distinguishes it from competitors' designs. Because the rotor is moving in line with the way the crop is fed into the machine, material is pulled into the rotor rather than being pushed in from the feeding system. This is a significant advantage in ensuring smooth feeding and reducing plugs. Bottlenecks are reduced because a Gleaner does not narrow the crop mat when moving from the feeder house to the rotor. The width of crop mat remains the same from the time it enters the feeder house to the time it enters the rotor, also reducing plugs and increasing threshing efficiency. Residue Management ; The ultimate in chaff spreading ; The standard chaff spreader on the Gleaner Super Series is an integral part of the combine and uses the high volume of air passing below the accelerator rolls to blow chaff out the back of the combine. It features an adjustable tailboard and fins to help spread shoe material into a wider swath as it leaves the machine. There is no stripping of material and no mechanical drives in the process. ; The optional hydraulic chaff spreader on all Super Series combines delivers the ultimate in chaff spreading and when used with the hydraulic straw spreader and redesigned spreader curtain provides an even wider spread of residue for tillage, planting and chemical applications. ; Straw, corn stalks and stems exit the rotor discharge where non-grain material is handled by either an impeller or chopper. To bale the straw or stover, simply remove the standard hydraulic spreader and drop the residue into a clean, compact windrow. The newly designed processor delivers a higher-quality straw sample for baling. Serviceability ; Get back in the field quickly if there is an issue ; Gleaner combines are built to be easily serviceable. The rotor in the Super Series can be removed in as little as 30 minutes. The majority of main service points are accessible at ground level. Belts, drives and pulleys are conveniently placed where they are readily accessible. ; The Gleaner Super Series is designed to have the fewest number of belts, chains, augers and gear drives possible to reduce the total number of moving parts, points of potential wear or breakage and the number of hours you have to spend on service. 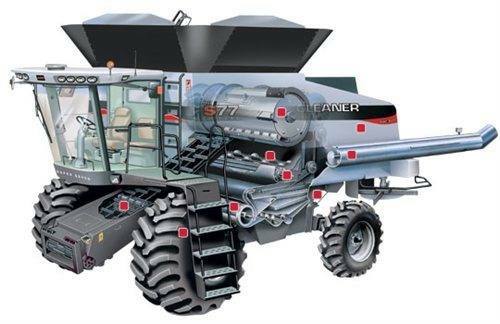 ; The walk-in rear engine compartment is the industry’s largest, and the combine’s overall low center of gravity puts most machine parts within easy reach from the ground. Easily accessible suction-type hydraulic filters, single reservoir and sight-level tube all work to limit service time demands without risking hydraulic system integrity. Threshing & Separating: ; Reduce grain loss ; Once in the rotor, separation takes place throughout the full 360 degrees of the rotor cage, meaning better effectiveness with less power. ; The 30-inch (762 mm) diameter CDF rotor uses six rows of 3/4-inch (18 mm) high-profile bars that are chromed and reversible in the threshing area. The bars build just enough pressure to release grain that often escapes other rotors, while taking less of a toll between bar and cage on the green-stem material. Three rows of three separator knives break up green material and reduce horsepower requirements.